Here's one advantage to discussing Rachel Cusk's trilogy of conversational novels: Because they're essentially plotless, there's little need to worry about spoiler alerts. The surprises and rewards of reading these books comes not from finding out what happens, but from getting pulled deep into their labyrinthine tête-à-têtes. 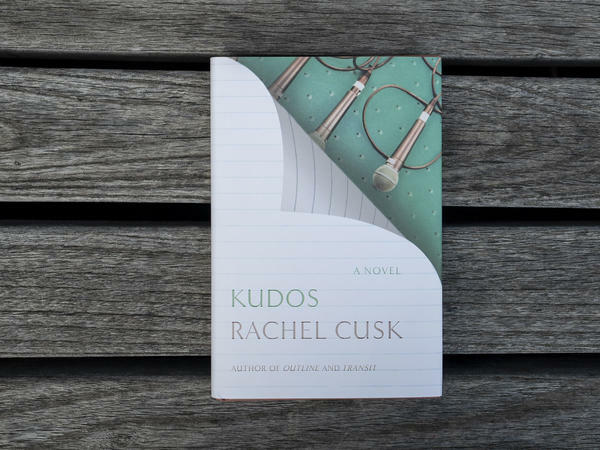 The third volume, Kudos, begins the same way that the first, Outline, did three years ago: With a surprisingly revealing conversation between the narrator, a British writer named Faye headed to a literary festival in Europe, and her airplane seatmate. It's also not giving away too much to say that Cusk ends her unusual project brilliantly — after hundreds of pages of talk — with a powerful, vaguely threatening encounter that unfolds in silence yet speaks volumes. But more of that later. Few writers have evolved as much as Cusk over the course of her career. Her early novels, including The Country Life and Arlington Park, were more conventional satires of the tolls of interdependence and family life. Then came her biting memoirs, A Life's Work: On Becoming a Mother and Aftermath: On Marriage and Separation, which raised hackles by bucking against society's bias towards domesticity. With Outline, Cusk set off on a new path, shifting to a sort of serial, stripped-down first-person storytelling that sometimes evokes podcasts-on-paper. In a world where most conversation is banal and repetitive and most people talk past each other, Cusk has created the ultimate, consummate listener. She has filled three books with the confidences her deliberately self-effacing narrator elicits from the people she meets while going about her daily business. This stream of seemingly random but carefully crafted, penetrating near-monologues drill deep into the issues most on Cusk's mind: Life's disappointments (failed marriages high among them), the challenges of self-definition in the context of family and motherhood, the state of publishing, and the often uneasy relationship between literature and commerce. Questions about whether there can be art without suffering, about parental influence on children, and about the connection between reward and gender also surface repeatedly in these interrogative, contemplative quasi-novels. Kudos takes its epigraph from Stevie Smith's poem "She Got Up and Went Away." The question of whether to stay or leave winds through its pages, beginning with the story Faye's seatmate unspools about his guiltily-solved dilemma: whether to stay home with his dying dog or head off to his teenage daughter's oboe concert abroad. But for Faye, staying versus leaving is no longer an urgent issue. Her situation has changed over the course of this trilogy, and she's come a long way from the unmoored recent divorcée we first met in Outline. In Transit, we saw her settling into her new, post-divorce life in London. Now she's remarried, and successful enough to be in demand for interviews at international conferences. The oldest of her two sons, with whom she enjoys easy "moments of grace," is about to go off to college. In other words, Faye left, and things have worked out for her. Good for Faye, but not so good for this third novel, because it feels like there's less at stake in these reported conversations. Cusk's narrator is less needy of life lessons, and even less of a presence. Her marked silence, and the convoluted confessions she provokes, frequently strain our patience or credulity. Where Transit left us looking forward to more, Kudos leaves us grateful that Cusk planned this as a trilogy and not a quartet. Cusk is at her sly best lampooning Faye's bizarre interviews with various self-absorbed journalists and critics who rarely get around to asking her any questions. In the first publicity junket, the interviewer confesses to having taken pleasure in making Faye envy her "simple, regulated life" when they met 10 years earlier — an unthinking existence she came to rue. When their time is up, the woman confesses that she'd actually found everything she needed for her article before she came. Another interviewer announces his idea to treat Faye as one of her own characters, "with himself granted the power of narrator" — in other words, essentially prodding her "to write the whole interview for him." So where does Cusk leave us? After a trying, blazingly hot day of pointless interviews, Faye heads to a somewhat creepy, mostly deserted beach for a dip. Alone. No conversation to record after fielding a call from her anxious younger son — just her own observations. While she's bobbing in the water, a "huge burly man with a great curling black beard" and "black eyes full of malevolent delight" approaches the shore and takes a copious leak. This leads to a surprising, provocative finale — more exclamation point than full stop — which captures the wary standoff between the sexes that runs through these three novels. It also aptly underscores just how daring and remarkable a literary feat Cusk's trilogy is.